Offering you a complete choice of products which include acetone, benzene, benzyl alcohol, cyclohexanone, dimethylformamide and dioctyl phthalate. Acetone is the organic compound with the formula (CH₃)₂CO. It is a colorless, volatile, flammable liquid, and is the simplest and smallest ketone. Benzene is an important organic chemical compound with the chemical formula C₆H₆. The benzene molecule is composed of six carbon atoms joined in a ring with one hydrogen atom attached to each. Benzyl alcohol is an aromatic alcohol with the formula C₆H₅CH₂OH. The benzyl group is often abbreviated "Bn", thus benzyl alcohol is denoted as BnOH. 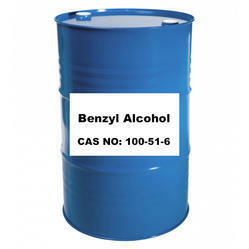 Benzyl alcohol is a colorless liquid with a mild pleasant aromatic odor. Cyclohexanone is the organic compound with the formula (CH₂)₅CO. The molecule consists of six-carbon cyclic molecule with a ketone functional group. This colorless oil has an odor reminiscent of that of acetone. Dimethylformamide is an organic compound with the formula (CH₃)₂NCH. Commonly abbreviated as DMF, this colourless liquid is miscible with water and the majority of organic liquids. DMF is a common solvent for chemical reactions. Bis(2-ethylhexyl) phthalate is an organic compound with the formula C₆H₄(CO₂C₈H₁₇)₂. DEHP is the most common member of the class of phthalates, which are used as plasticizers. It is the diester of phthalic acid and the branched-chain 2-ethylhexanol. Ethylene glycol is an organic compound with the formula (CH₂OH)₂. It is mainly used for two purposes, as a raw material in the manufacture of polyester fibers and for antifreeze formulations. Formaldehyde is a naturally occurring organic compound with the formula CH₂O. It is the simplest of the aldehydes. The common name of this substance comes from its similarity and relation to formic acid. Glycerol is a simple polyol compound. It is a colorless, odorless, viscous liquid that is sweet-tasting and non-toxic. The glycerol backbone is found in all lipids known as triglycerides. Isopropyl alcohol is a compound with the chemical formula C¿¿¿H¿¿¿O. It is a colorless, flammable chemical compound with a strong odor. Butanone, also known as methyl ethyl ketone, is an organic compound with the formula CH₃CCH₂CH₃. This colorless liquid ketone has a sharp, sweet odor reminiscent of butterscotch and acetone. Methyl isobutyl ketone is the organic compound with the formula (CH¿¿¿)¿¿¿CHCH¿¿¿CCH¿¿¿. This colourless liquid, a ketone, is used as a solvent for gums, resins, paints, varnishes, lacquers, and nitrocellulose. Methylene dichloride is a geminal organic compound with the formula CH₂Cl₂. This colorless, volatile liquid with a moderately sweet aroma is widely used as a solvent. Although it is not miscible with water, it is miscible with many organic solvents. Nitrobenzene is an organic compound with the chemical formula C₆H₅NO₂. It is a water-insoluble pale yellow oil with an almond-like odor. It freezes to give greenish-yellow crystals. 2-Ethylhexanol is a branched, eight-carbon chiral alcohol. It is a colorless liquid that is poorly soluble in water but soluble in most organic solvents. Styrene, also known as ethenylbenzene, vinylbenzene, and phenylethene, is an organic compound with the chemical formula C₆H₅CH=CH₂. 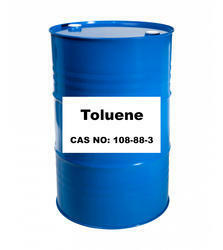 Toluene, also known as toluol, is an aromatic hydrocarbon. It is a colorless, water-insoluble liquid with the smell associated with paint thinners. It is a mono-substituted benzene derivative, consisting of a CH₃ group attached to a phenyl group. The chemical compound trichloroethylene is a halocarbon commonly used as an industrial solvent. It is a clear non-flammable liquid with a sweet smell. Vinyl acetate is an organic compound with the formula CH₃CO₂CH=CH₂. This colorless liquid is the precursor to polyvinyl acetate, an important industrial polymer. Dimethylbenzenes; Methyltoluene; Xylene (mixed isomers); Methyl toluene; Mixed Xylenes; Total xylenes More... ... Xylene is a mixture of three structural isomers of the aromatic hydrocarbon dimethylbenzene:1, 2-Dimethylbenzene, 1, 3-Dimethylbenzene and 1, 4-Dimethylbenzene. o-Xylene is an aromatic hydrocarbon with the formula C₆H₄(CH₃)₂. with two methyl substituents bonded to adjacent carbon atoms of a benzene ring. It is a constitutional isomer of m-xylene and p-xylene, the mixture being called xylene or xylenes. Ethyl acetate is the organic compound with the formula CH 3–COO–CH 2–CH 3, simplified to C 4H 8O 2. This colorless liquid has a characteristic sweet smell and is used in glues, nail polish removers, decaffeinating tea and coffee, and cigarettes. Isopropyl alcohol is a compound with the chemical formula C₃H₈O. It is a colorless, flammable chemical compound with a strong odor. 1-Propanol is a primary alcohol with the formula CH₃CH₂CH₂OH. This colorless liquid is also known as propan-1-ol, 1-propyl alcohol, n-propyl alcohol, and n-propanol. It is an isomer of 2-propanol. α-Methylstyrene is a chemical intermediate used in the manufacture of plasticizers, resins and polymers. It is a co-product formed in a variation of the cumene process. Butyl Cellosolve is an organic compound with the chemical formula BuOC₂H₄OH. This colorless liquid has a sweet, ether-like odor, as it derives from the family of glycol ethers, and is a butyl ether of ethylene glycol. Diacetone alcohol is a chemical compound with the formula CH₃CCH₂C(CH₃)₂, sometimes called DAA. This liquid is a common synthetic intermediate used for the preparation of other compounds, and is also used as a solvent. Diethylene glycol is an organic compound with the formula (HOCH₂CH₂)₂O. It is a colorless, practically odorless, poisonous, and hygroscopic liquid with a sweetish taste. It is miscible in water, alcohol, ether, acetone, and ethylene glycol. The chemical compound 1,2-dichloroethane commonly known as ethylene dichloride, is a chlorinated hydrocarbon. It is a colourless liquid with a chloroform-like odour. Hexane is an alkane of six carbon atoms, with the chemical formula C¿¿¿H¿¿¿¿¿¿. The term may refer to any of the five structural isomers with that formula, or to a mixture of them. Petrachloroethylene, also known under the systematic name tetrachloroethene, or perchloroethylene, and many other names, is a chlorocarbon with the formula Cl¿¿¿C=CCl¿¿¿. PEG 400 is a low-molecular-weight grade of polyethylene glycol. It is a clear, colorless, viscous liquid. Due in part to its low toxicity, PEG 400 is widely used in a variety of pharmaceutical formulations. Polyethylene glycol is a polyether compound with many applications from industrial manufacturing to medicine. PEG is also known as polyethylene oxide or polyoxyethylene, depending on its molecular weight. Sorbitol, less commonly known as glucitol, is a sugar alcohol with a sweet taste which the human body metabolizes slowly. It can be obtained by reduction of glucose, which changes the aldehyde group to a hydroxyl group. Triethanolamine aka Trolamine is a viscous organic compound that is both a tertiary amine and a triol. A triol is a molecule with three alcohol groups. Triethanolamine is a strong base. Approximately 150,000 tonnes were produced in 1999. Acrylonitrile is an organic compound with the formula CH¿¿¿CHCN. It is a colorless volatile liquid, although commercial samples can be yellow due to impurities. In terms of its molecular structure, it consists of a vinyl group linked to a nitrile. Aniline is an organic compound with the formula C¿¿¿H¿¿¿NH¿¿¿. Consisting of a phenyl group attached to an amino group, aniline is the prototypical aromatic amine. Isobutanol is an organic compound with the formula (CH¿¿¿)¿¿¿CHCH¿¿¿OH. This colorless, flammable liquid with a characteristic smell is mainly used as a solvent. m-Xylene (or meta-xylene) is an aromatic hydrocarbon, based on benzene with two methyl substituents. It is an isomer of o-xylene and p-xylene. ... Mix-Xylene (Solvent) is an aromatic hydrocarbon generally extracted by distillation from a mixed xylene stream. Butyl acrylate is a chemical used in manufacturing. N-Methyl-2-pyrrolidone is an organic compound consisting of a 5-membered lactam. It is a colorless liquid, although impure samples can appear yellow. It is miscible with water and with most common organic solvents. Propyl acetate, also known as propyl ethanoate, is a chemical compound used as a solvent and an example of an ester. This clear, colorless liquid is known by its characteristic odor of pears. Looking for Industrial Chemical Drum ?